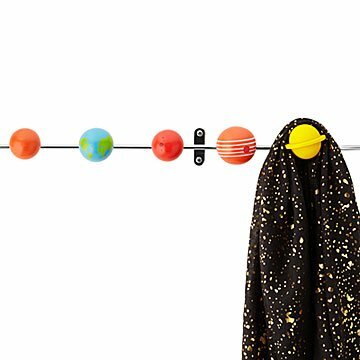 Try defying gravity with this planetary coat rack. We all understand the force of gravity: It's the reason coats and bags seem to pile up right inside the front door where they're dropped. But this planetary coat rack might just be the boost you need to get them up off the ground. The eight hooks are capped with wooden balls that resemble the planets of our solar system, from the dusty gray of Mercury to the vibrant blue of Neptune. Space lovers of all ages can claim a planet for their own just by hanging up their things, and kids can learn more about our place in the universe at the same time. Made in China. My two-year old now loves hanging up his coats on his own, just to talk about the planets. Of course, I didn't anticipate the fact that he also likes to take all the coats down, just so he can see all the planets. Work in progress. It's a beautiful item to have on the wall and we're having a lot of fun with it.